How unexpected. I was coming home last evening after a day in the suburbs and I came across a French Red Cross march on the Champs Elysées ! I suppose it was to celebrate the 150 years of this fantastic organisation. For once I did not have my big camera so I used my phone instead (hence the bad quality). It is a splendid organization, and I love the angle of the photo! It looks like their work continues to be an uphill struggle. (Sorry, it's a disease.) Anyway, if you had not said it was taken with your phone, I wouldn't have guessed it. I worked at the French Red Cross last year, and this march wasn't specifically to celebrate the 150th anniversary of the organization. It takes place every year on the Champs Elysées to rekindle the flame of rememberence on the tomb of the Unknown soldier. 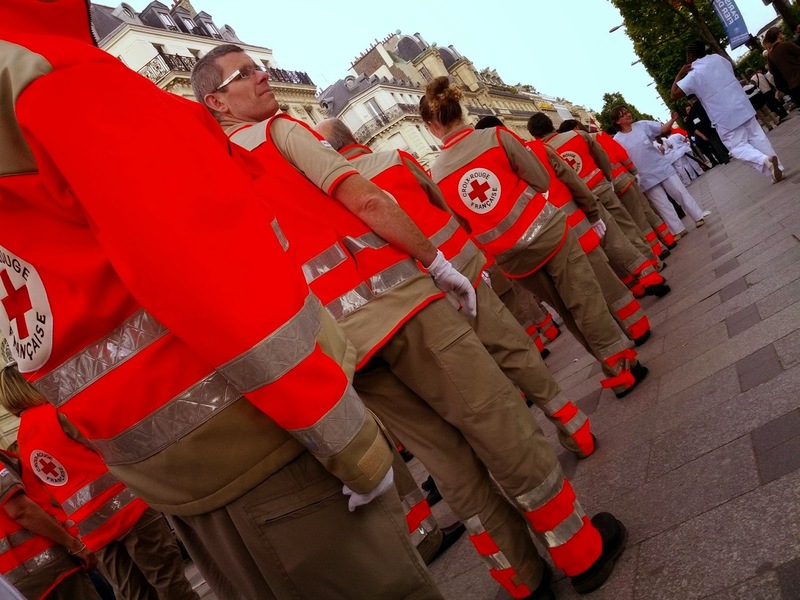 This march is made up of the employees and volunteers of the French Red Cross.